Many people want to meet and work with a successful professional dowser. Russ has offered a two-day seminar all over the USA for more than 35 years. Now, you can visit Russ in West End, NC and discuss your personal situation with him. Bring your video tapes, bring your equipment, bring anything you want and Russ will critique your procedures and offer specific suggestions to take you to the next level of successful treasure hunting. If you are at the beginning stages visit Russ and spend time with him to get off in the right direction. 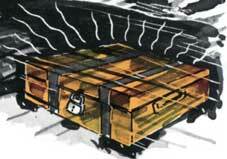 Russ will teach you to locate treasures, minerals, water, oil, caves, mines, and similar topics one-on-one. 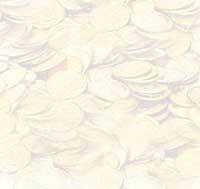 All you need do is contact him at 910-686-1656 and arrange for a mutually agreeable time. This is an excellent opportunity to learn from a professional, to learn the proper techniques, and to have the individual attention that only a mentor can provide. The fee for this tutorial session is $300 for 1/2 day and $500 for all day. Call Russ now! Get on the right track and make the find that has been causing your frustration! The Revised Professional's Complete Dowsing Course is a 250 page manual providing many different exercises. These exercises teach the reader how to become a successful dowser. The Revised Professional's Complete Dowsing Course has many charts, photographs, illustrations, and descriptions to ensure that the reader understands exactly what to do in order to dowse successfully for treasure, minerals or other targets. This is a step-by-step instructional course. 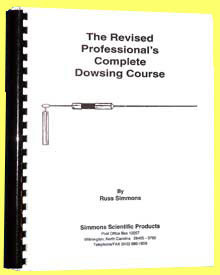 Written by Russ Simmons, a renowned author, lecturer, and instructor, The Revised Professional's Complete Dowsing Course is in its seventh printing testifying to its value as an aid in learning how to dowse properly. This book is a must for the successful dowser. It can ordered for only $75. 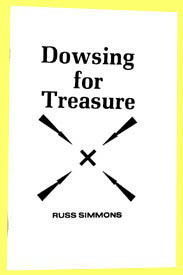 Dowsing for Treasure is written by Russ Simmons, is for the person who is interested in dowsing. Dowsing for Treasure shares information on dowsing techniques and enlightens its reader on many important aspects of dowsing. If you are a treasure hunting enthusiast, a dowser, or a person wanting more information, Dowsing for Treasure is the book that will meet your needs. It can ordered for only $20. Carl Anderson of Tampa, Florida, started building and using dowsing equipment in the 1960's and in 1970 began offering his equipment for sale to other treasure hunters. He developed a line of what we believe to be the finest and most effective equipment available anywhere, at any price. There are, reportedly, thousands of his instruments in use worldwide. Mr. Anderson has stopped building dowsing equipment in order to devote his full time to other pursuits, including treasure hunting. Simmons Scientific Products has acquired the rights to this equipment from Mr. Anderson, and each instrument is built according to Carl Anderson's exact specifications.